Core Drill Rental – Core Cut – M2, is available for rent in Rochester NY, Ithaca NY and the entire Western New York region from the Duke Company. 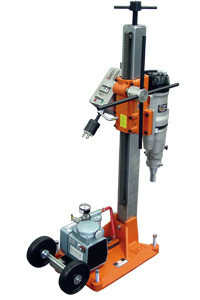 The rental Core Cut M-2 combination core rig without vacuum can be rented, features a dual switch control panel with amp meter, 4 spoke handle, and 2 7/8 inch, precision square mast. The unit has 6 inch wheels or mobility, and leveling screws. This precision drill is built for high torque and large bits.